The 2006 vintage benefitted from near ideal growing and ripening conditions. The crop was small and the resulting fruit showed great intensity right at the presses. The Brut cuvée has wonderful floral and fruit aromas and near perfect balance. This cuvée has aromas of white flowers, apple pie baking and citrus peel enhanced with notes of toast and vanilla. 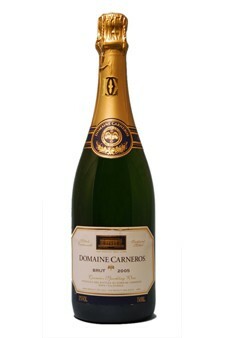 The wine is elegantly structured, round and flavorful with the long creamy finish that is the hallmark of Domaine Carneros wines. Lovely served with double or triple cream cheeses, it also matches especially well with oysters, shellfish, fish, poultry, Asian and California cuisine.